Have you ever wondered by Revere—a coppersmith, with minimal riding skills—was chosen to deliver the message through the Massachusetts countryside? Often pictured as a young man on a fiery steed, the Paul Revere who carried the news of the British foray into the Massachusetts countryside was over forty years old and fell off his “fast, borrowed mare” as he rode through the night. Revere, born in 1735, was a descendent of French Huguenots. His father Apollos had come to America at the age of 13 and worked as an apprentice in a silversmith shop. Paul followed his father’s trade, but soon expanded his work to experiment with engraving portraits and songs on copper plates. As an artist, he penned cartoons, which he engraved, and which eventually appeared in the Royal American Magazine. His business included production of dental devices, frames for portraits by the great artist Jonathan Singleton Copley, coats-of-arms, bookplates, and other engravings. He earned the respect of the mechanics (as they were then called, or, in modern parlance, “craftsmen”) in Boston, and indeed was looked to as their leader. Revere was also a revolutionary in the political sense: he had participated in the boarding of an English ship during the Boston Tea Party, and acted as a messenger for the Sons of Liberty. Soon, any message the patriot groups needed to deliver was entrusted to Paul Revere. He took the Suffolk Resolves to Philadelphia; served as the official courier for the Massachusetts Provincial Assembly to Congress; and warned the colonists holding the military stores of Fort William and Mary of General Gage’s planned strike. (Those stores eventually provided powder and shot that covered the retreat from Breed’s Hill.) British units stopped Revere after he warned Hancock and Adams—Dr. Samuel Prescott actually warned the minutemen at Concord and Dawes probably reached a larger population with his clarion calls—but Revere was released and he escaped Lexington with a trunk of papers left by Hancock. Revere wanted to fight, but the revolutionary cause needed his talents elsewhere. He designed and printed the first Continental money; made the first official seal for the colonies and the seal of Massachusetts (still used today); directed the manufacture of gunpowder in Canton; and eventually commanded a garrison at Castle William in 1779. 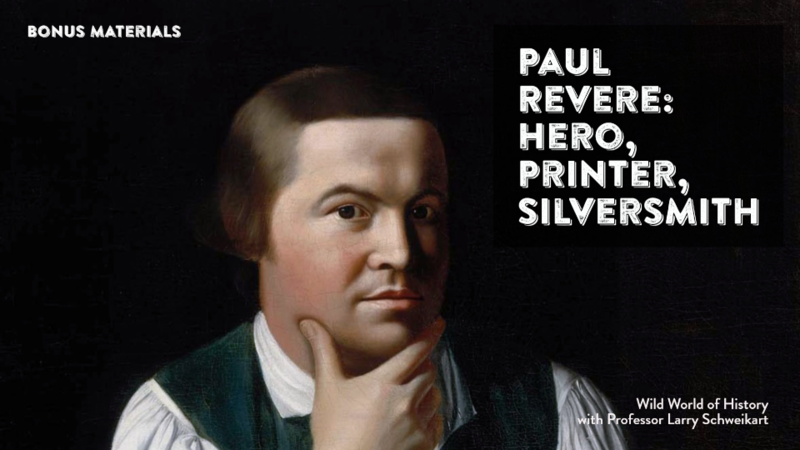 After the Revolution, at age 65, Paul Revere expanded his business to provide copper plating and accessories a for the U.S.S. Constitution , better known as “Old Ironsides.” His Revere silver to this day remains a popular style of dinnerware, and his rolling process for sheet copper provided copper plates for Robert Fulton’s Clermont, the first steam vessel. As a businessman, patriot, artist, civic leader, husband, and father, Paul Revere has remained a legendary figure of the American Revolution. Source: David Hackett Fischer, Paul Revere’s Ride (New York: Oxford, 1994); Larry Schweikart and Lynn Doti, American Entrepreneur.